Here is the list of the hotels near Villette. Book your hotel near Villette today, Tuesday 14 May for the best price, reservation and cancellation free of charge thanks to our partner Booking.com, leader in on-line hotels reservation. Below here is the list the 50 closest hotels of Villette, sortable according your criteria. You will find the position of these accommodations on the Villette hotels map. Welcomotel Les Mureaux is located in Les Mureaux, 34 km west of Paris. 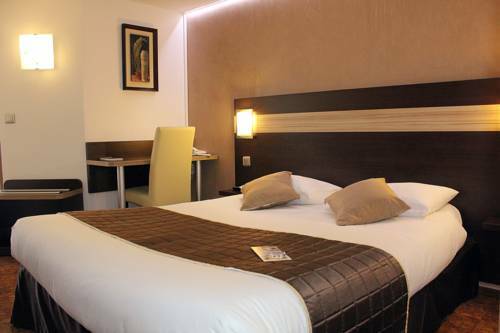 It offers en suite rooms equipped with a flat-screen TV and free WiFi internet access. A buffet breakfast is served daily. There are a number of restaurants located opposite the hotel. Welcomotel Les Mureaux provides free private parking and is easily accessible by A13 and A14 motorways. Paris is 30 minutes away by train and La Defense can be reached in 20 minutes by bus. Boasting a terrace and a bar, Alpha Hotel is located in Bouafle. All rooms feature a flat-screen TV with satellite channels and a private bathroom. The accommodation offers free WiFi. At the hotel, all rooms are equipped with a desk. A continental breakfast is available every morning at Alpha Hotel. Paris is 39 km from the accommodation, while Versailles is 29 km from the property. The nearest airport is Paris - Orly Airport, 54 km from the property. Hotel - Restaurant La Chaumière is located in a residential district, a 15-minute walk from Les Mureaux Train Station. It has a garden with a terrace and offers free Wi-Fi access. The soundproofed rooms all have a private bathroom. Each room has a flat-screen TV with satellite channels and a work desk. Traditional cuisine is served in the restaurant and a buffet breakfast is available each morning in the dining area. Hotel - Restaurant La Chaumière is just 1 km from exit 8 of the A13 motorway and free private parking is available on site. Paris is a 45-minute train-ride away. Below here is the hotels map of Villette. Names and details of Villette hotels can be shown on the map clicking on the prices icons.